St. Joseph’s Church, Fort Collins, Colo. 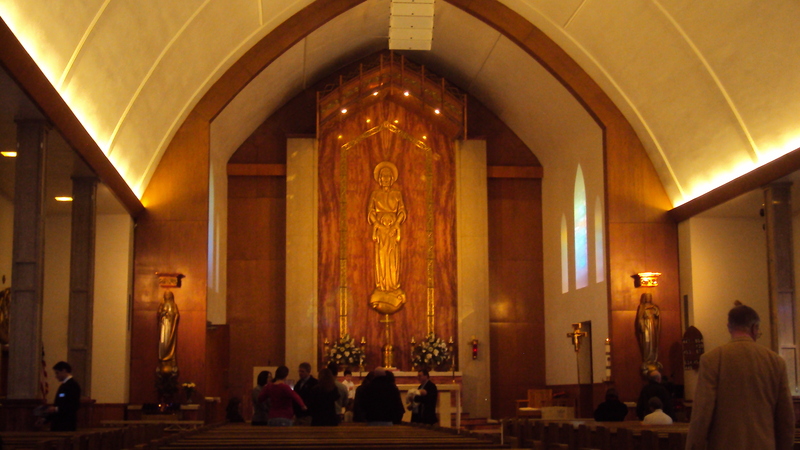 I will never go back to St. Joseph’s Catholic Church, not because I tainted the holy water in elementary school, but because it’s the most judgmental church I’ve visited. Nothing about St. Joe’s embodies peace, love or understanding. Before I delve into my own judgments, let me say I know it’s contradictory to condemn judgment and then judge but processing experience necessarily requires judgment. Also, this opinion is based on the 1.5 hours I spent in one church. By no means do I think all Catholics adhere to these values or lack there of. From the street, St. Joe’s is beautiful. 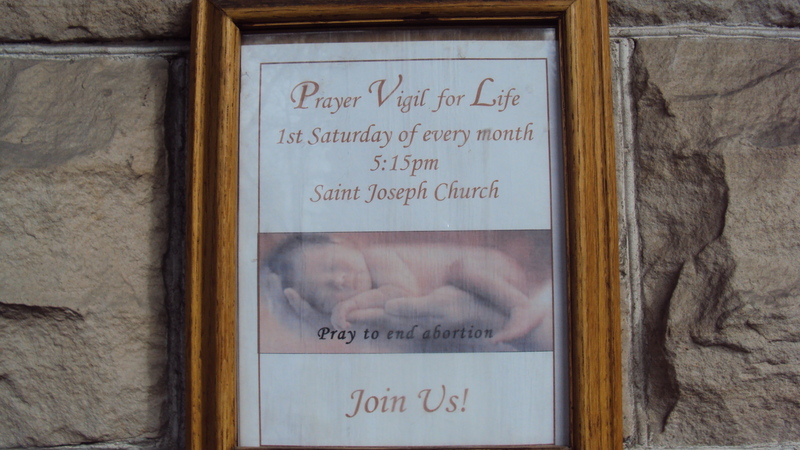 From the street, you can’t see the picture of a fetus (it isn’t graphic) framed by words urging congregants to pray to end abortion. I don’t care what people think about abortion. Life, choice, whatever. I also don’t care about political views. Democrat, Republican, anarchist, whatever. What irritates the living hell out of me is listening to a priest tell a hundred people or so how they should feel about abortion or politics. Unfortunately for the congregation and the advancement of peace and understanding through Christ, this priest focused on condemning those who make poor choices, such as abortion. Well, that and contradicting himself. Sometimes I’m a little slow, but the Bible led me to believe that there’s only one God. Google’s helped me understand that there’s billions of people on this earth so, if the relatively small St. Joe congregation judges those who abort, doesn’t that mean that more than 100 people in tiny little Ft. Collins are playing God? My dad was raised Catholic. He’s got some great stories about naked swimming and nun brutality. While I can’t speak to his experiences, heavy-handed Catholics continue whacking from the pews. The woman in front of me had three kids. The husband immediately left with the little one. The poor thing was terribly sick but I would have preferred her fever and hacking cough to time with mom who, between praying and singing, occupied her time by whacking her sons on the head, pinching their arms, yanking their wrists, flicking them in the middle of the cranium with her thumb and pointer finger and threatening spankings. The Punisher didn’t smile, but neither did anyone else. I saw a lot of kids and a lot of young parents — good honest Catholics using the ‘ol rhythm method, holding tight to their anti-abortion stance — but I didn’t see many smiles and I certainly didn’t feel like I was part of a community. In fact, not one person returning from communion reception looked happy or even content even. Either something’s askew in the church or Christ tastes like garbage. Not that they’d want me, but I’m passing on Catholicism. NOTE: Once again I blew it with the pics. I took plenty, but I’m out-of-town and forgot the adapter. I’ll add them when I return. Want to Lose Weight in 2011? Tell the Truth. I develop what I perceive to be ingenious business ideas at least twice a day. Most recently, I started researching surrogacy and house sitting, the idea being that by combining the two, I could support my writer lifestyle, travel and help people who can’t have children. Unfortunately, families looking for surrogates are not exactly keen on nomadic women without a stable life plan. The plan is simple — tell your most difficult truths to the people who will suffer the most from them and bam, you’re ready for the runway. I’ve always had a wicked fast metabolism, I workout, I eat fairly well and I’ve never dieted. Until now. I told a zinger of a truth and have since lost a ridiculous amount of weight I didn’t need to lose. In fact, if I hadn’t slammed my hair in my car door while gassing up my car in Iowa, I would have been whisked away by raging 80 mph winds. If it weren’t for fermented grapes and Colorado’s finest breweries, I would have already fallen through one of my parents’ heat registers. Unfortunately “The Accidental Anorexic” business model isn’t sustainable because at some point, the guilt that causes truth tellers to choke on their food will subside and they’ll either start eating or slide into a real eating disorder, which is neither desirable nor funny. So I’m changing my business plan…again. For a nominal fee, I will absorb weight other woman want to lose and slough it off in a week. Physiologically impossible, yes. Sustainable, definitely. Paul loves to write letters and many of them are about telling the truth, being honest, blah, blah, blah. He’s emphatic about it, using the one exclamation point in these letters to emphasize his point. This is much easier said then done, which is why the Catholic Church invented the confession booth. It’s a lot easier to sit in a box and spill your sins through a screen than it is face the person you sinned against and say listen, I want to tell you exactly how I destroyed your life. Think about it. Nowhere in the Bible does it say people should sit in a box to confess their sins. They do it in the open, fall on their knees, tear out their hair, wrap themselves in sackcloth. Above all else, they fast. Less than a hundred pages from the end of the Bible and I’m FINALLY living the way God wanted me to. I told the truth, I’m suffering and I’m fasting. Hopefully he’ll forgive me for trying to make a profit on the experience. The Human Fat Burner, LLC., will be on-line later today. The initial consultation is free. Please feel free to contact me here.